But Reed said this week that he did not step on the first tee feeling too confident about how that fateful Sunday (because they're all fateful Sundays at Augusta) was going to go. He was paired with Rory McIlroy -- whom he would go on to crush -- but all he was doing early was trying to get off the first tee box. "I'd be lying if I said I wasn't nervous," Reed said on Monday. "... I slept great Saturday night, woke up Sunday and just kind of had this, just, calmness about myself and about the day. ... I felt like I was hitting the ball well. I felt like I was putting well, felt like I was chipping well. Just kind of felt like another day at the golf course." "Then all of a sudden, once I left the putting green by the first tee and I walked to the first tee, when I stepped foot on that first tee, I was like, 'Oh, man,'" added Reed. "Butterflies were going, I looked at [caddie] Kessler, Kessler looked at me, and Kess goes, 'Don't worry, I feel it, too.' He's like, 'Let's just get off this first tee.' And when I stood up there, he goes, 'All right, here's a 3-wood,' and I looked at him, I go, 'We just can't go right.' He goes, 'That's fine, then hit it left and let's go.' I hooked the tee shot a little left, and once I got up to that iron shot, the nerves went away. "I expected the nerves. I expected the nerves to be there a little longer than what I expected, but I was able to get myself in the right mind frame and the mindset going in that the nerves left me after I got done with the first tee shot, and then it was just go out and play golf and get back to what I was doing earlier in that week." "I'd start off by telling myself to hit more fairways and to leave the ball below the hole," said Reed. "You know, it's one of those places that every time you seem to go there, whether it was the first tee all the way even through last year, you just learn new things about the golf course year in and year out. It's one of those places that even if you have the perfect game plan, you have to execute your golf shots. "It's almost like every tournament you play, but ... more penalizing times a hundred. You can get away with missing golf shots at other events, but when you go to Augusta, any little weakness in your game or any missed golf shot you're going to get penalized for it. I mean, one thing I'd tell myself is you just have to make sure you're really sharp on every aspect of your game." It was a plan that worked in 2018. If it works again, Reed would become the first back-to-back champ since 2001-02 when Tiger Woods did it. If it doesn't, he'll be doing the thing he dreads the most. "My least favorite moment is going to be when I have to return the jacket and I'm not allowed to have it in my closet and wear it around the house and out at places," said Reed. "It's definitely going to give me motivation to go out and try to repeat as well as try to win multiple. 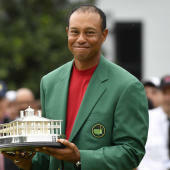 "Even the times I'm not actually wearing the green jacket, to be able to see the green jacket sitting in your closet or sitting in an area where you're always kind of walking by and you'll see it, it just gives you motivation and kind of picks me up and tells me that you want to keep it around. You want to keep it around as long as you can. The only way you're going to do that is continue winning at Augusta and continue winning the event so you can have it year in and year out."